A 6.7-magnitude earthquake hit off the northern coast of Chile on Sunday evening, prompting a brief evacuation of part of a coastal area but not causing any injuries or significant damage. 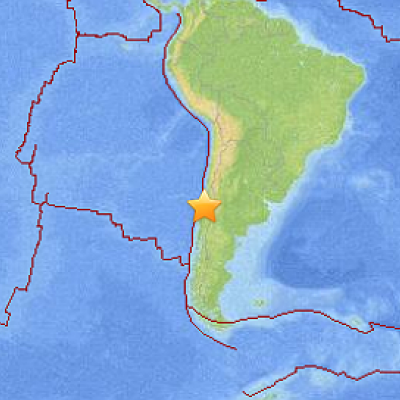 The strong quake – originally measured as a 7.0 – was centered 37 miles west-northwest of Iquique and struck at a depth of 12.4 miles, the US Geological Survey said Sunday. It hit at 6.16 p.m. local time. An emergency office said there was no major damage resulting from the quake, except for two small roadside rock falls in the Arica and Parinacota region. The Pacific Tsunami Warning Center said no tsunami was expected. A second quake, a 5.1 at almost the exact same location, followed 10 minutes later. An aftershock at 6.2 followed about six hours later.